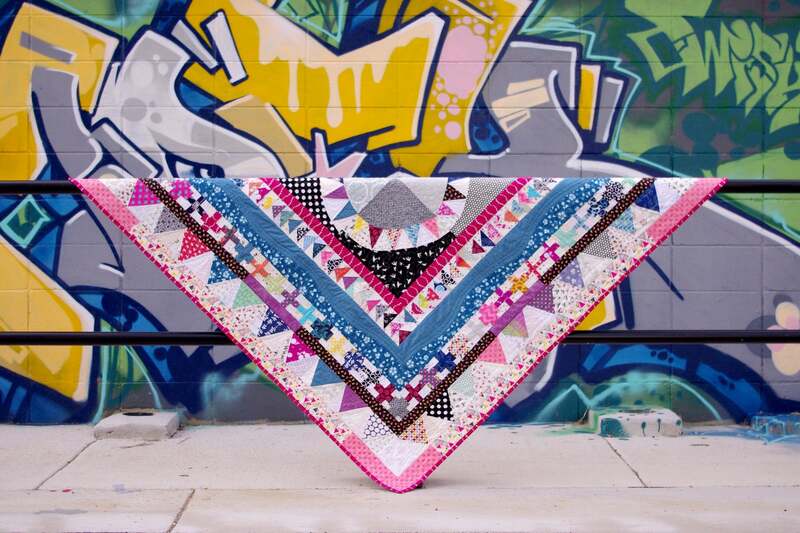 I don’t know what it has been lately, but I am really craving hand piecing projects. Maybe its the extra hours in lecture theatres (even the most interesting subject would mean nodding off! ), or maybe it’s a re-found desire to create using my hands. 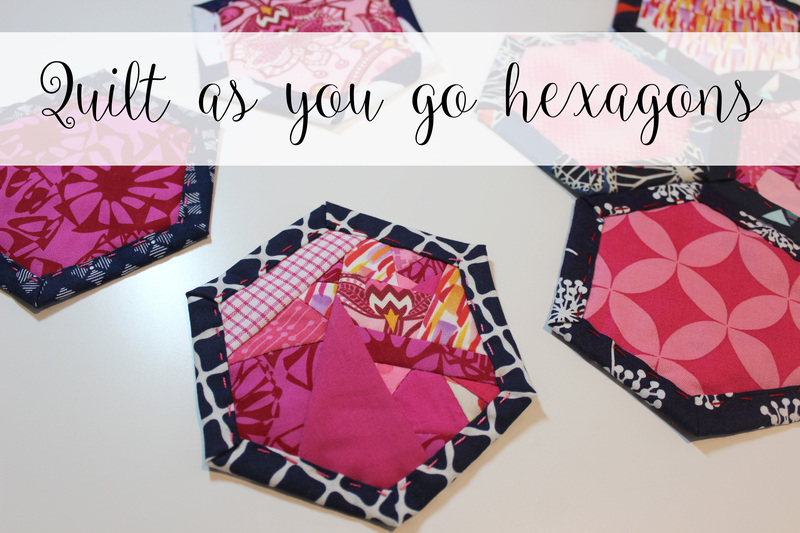 These quilt as you go hexagons are perfect for keeping hands busy and are a really quick way to knock up a quilt. I’m using a combination of navy and pink fabrics, but you know this is a perfect scrap buster. 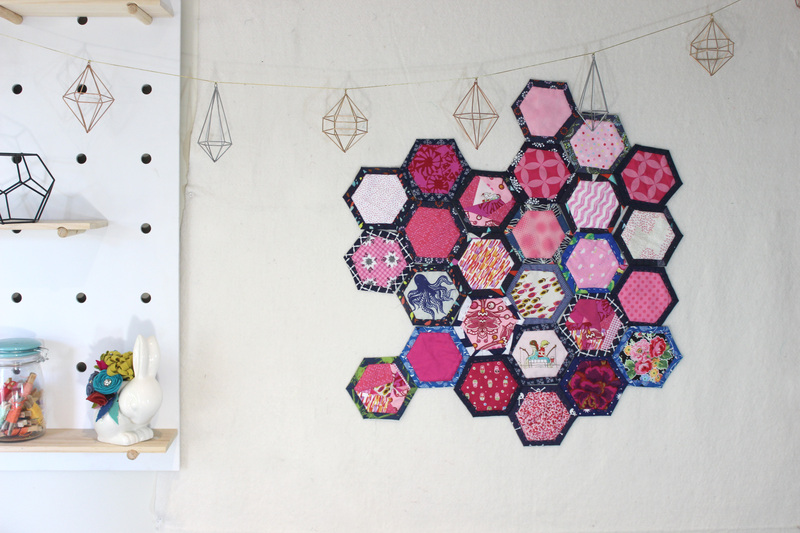 Because I hate wasting even a drop of fabric, I have made a few pieced hexagons using up the awkward pink fabric offcuts. I would also like to encourage you to use salvaged and recycled fabric. You could use an old skirt that no longer fits, or check out your local second hand store for the literal thousands of textiles and fabric available. 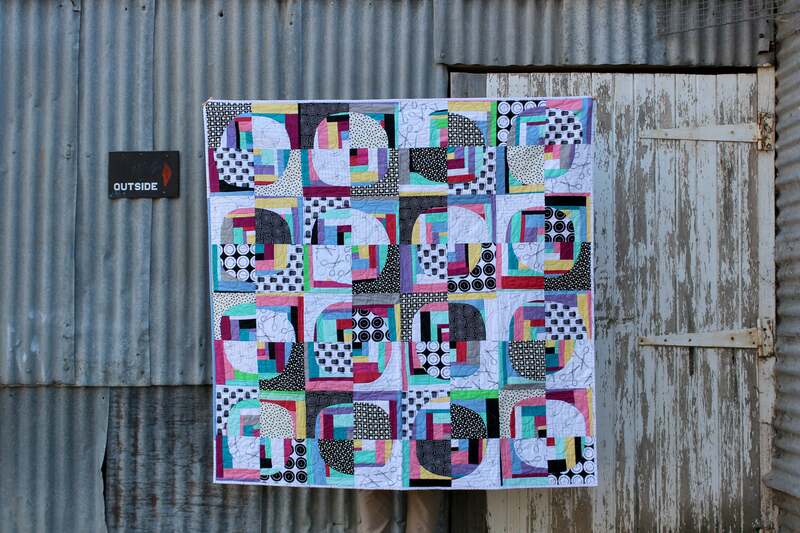 Think beyond the quilting cotton and you will be pleasantly surprised with what you find. Finally, if you make up these hexagons, I would love to see them so go on and tag your photos with #hexyalong on social media. My hexagons are a decent size, but you can use any size, as long as the bigger size is 1″ large on all sides, or 2″ size difference (eg 3″ vs 5″ or 8″ vs 10″). I am using the Jaybird Quilts Hex N More ruler as thats what I had on hand and it had the two size differences that I need to make the quilt. You can use templates or smaller hexagon templates (like the ones that come with the paper pieces for EPP), just as long as you follow the size difference rule. 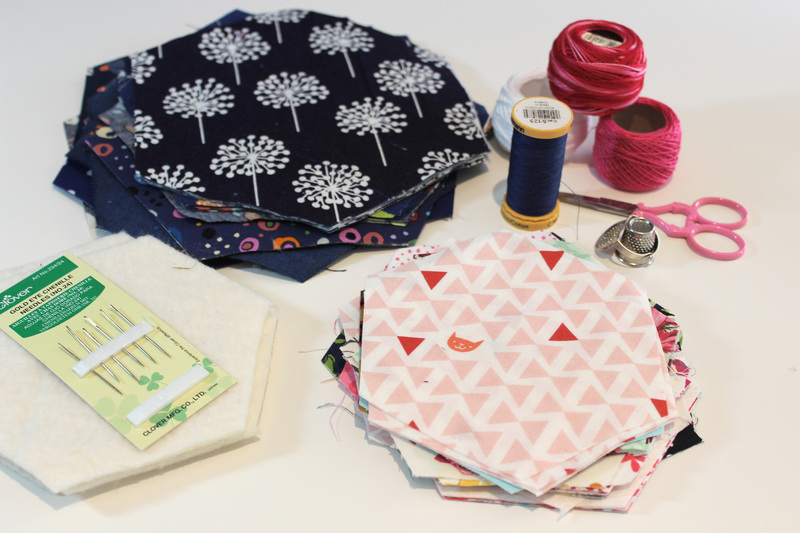 The fabric guide below is for one hexagon unit. Depending on your finished size, you will need to create many more. For a queen size quilt, you will need around approximately 270 hexagons (finished size: 81″ x 82½”). 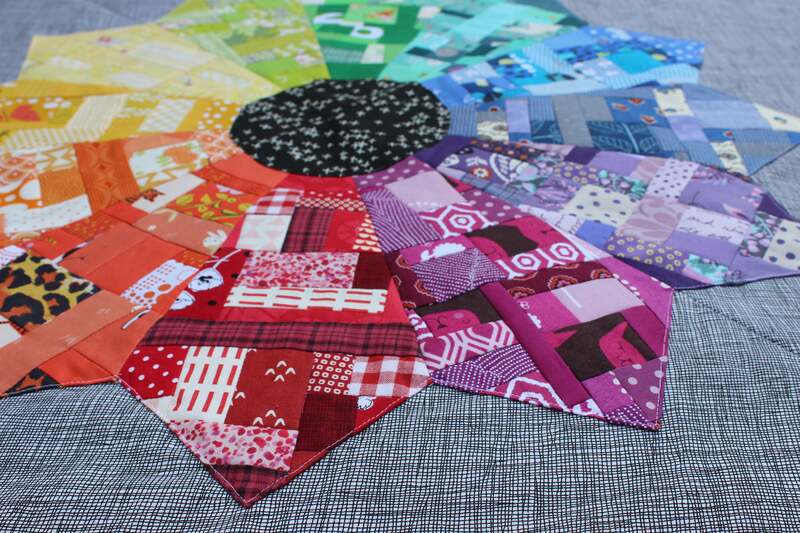 Go on and make your own quilt as you go hexagons – they’re so fun and easy! Cut the square from fabric one and the batting using the small (I used the 4½” marks on the Hex N More ruler) hexagon template and cut the square from fabric two using the large (I used the 6½” marks on the Hex N More ruler) hexagon template. Layer these on top of each other with the large hexagon facing down, the batting in the middle and the small hexagon right side up. You can pin these together – I found three pins to be sufficient to hold it all in place and not get in the way. Start by folding one edge of the large hexagon so that the raw edge touches the raw edge of the small hexagon. Then fold the edge over the top of the small hexagon to enclose everything in. Take your quilting thread and bring it up about halfway along the first edge, catching it under the folded edge. take a running stitch along the top of the folded edge catching all the layers. stop just before the corner, fold the next edge down and continue quilting all the way around until you reach the beginning. Finish by burying a knot in the batting. 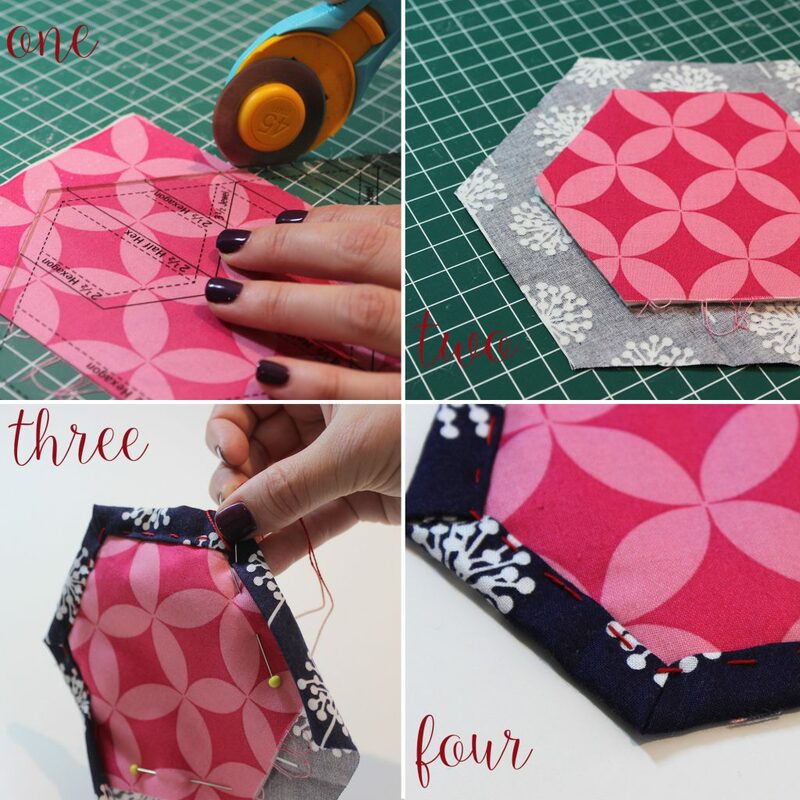 To sew the quilted hexagons together, place two hexagons right sides together, and using a fine, coordinating sewing thread stitch them together. You can use either a ladder stitch or a whip stitch, whichever you prefer. I’m looking forward to making these, I love hand sewing in the car and by tv! I am jealous of your car sewing ability! I just spend about 40 hours in the car over the Christmas break – imagine all the hexies I could have finished in that time!